Sprinkle the salt evenly over all surfaces of the salmon, and let it cure overnight in the refrigerator. The next day, grill the salmon on a wire rack under the broiler until cooked through. Break the salmon up into bite-size pieces, removing and discarding any skin and bone. Prepare the rice by adding it to a large bowl and pouring boiling water over it. Stir to break up any clumps, and then strain the rice, discarding the water. 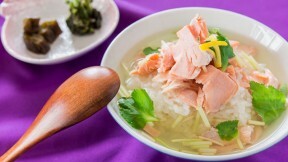 Portion the rice into two bowls and top with the salmon, herbs and lemon zest. Brew the tea, and pour it over the rice. Stir together and eat with Japanese pickles.